22 years ago, Tom Nechville was approached by Wintergrass promoter Earla Harding at IBMA in Kentucky. Tom accepted her invitation to participate as a vendor at a new festival called Wintergrass, and has been a part of it ever since. Over the years, Nechville has been a part of various Wintergrass programs and workshops, teaching and providing mini-banjos to kids. This long term commitment to led to Nechville becoming one of the festival’s major sponsors. For several years, Nechville has donated a banjo worth between $3000 to $5,000 while exhibiting his unique line of banjos and doing on-site repairs for pickers. And yes, another Nechville banjo will be up for raffle again this year. “The friendships I have made out here have made all the difference in my business,” says Tom Nechville. Nechville’s business was propelled forward when one of his Wintergrass customers and friend, Al Price from Auburn WA decided to go to work for him as Nechville’s sales and marketing manager in 2004. 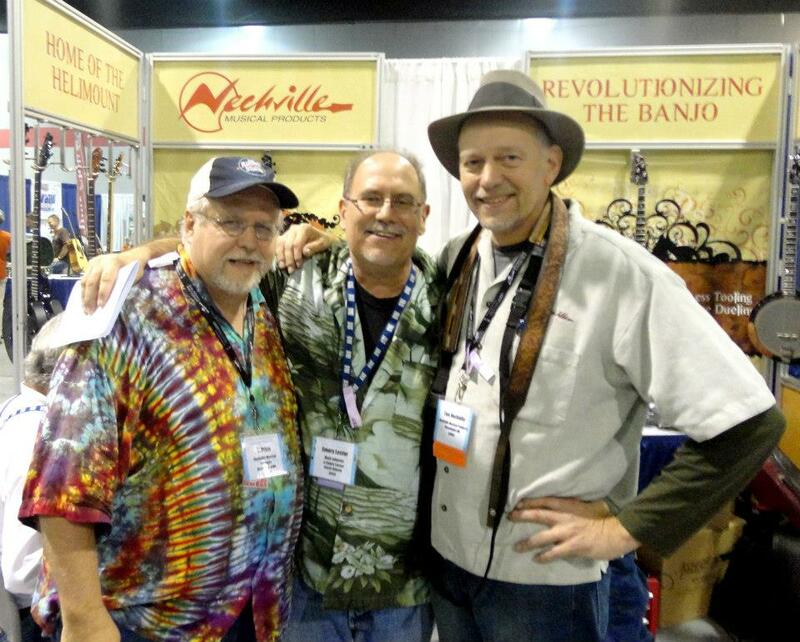 Nechville Banjos from Minneapolis MN stand out as being the world’s leader in banjo design and innovation. “Being a picky musician and an inventor, I can’t stop finding new solutions to old banjo problems,” Tom says. Nechville makes banjos for everyone, but has had particular success with traveling performers. Steve Martin likes his Orion because it keeps its consistent good tone even after rugged tour transport. Nechville is the originator of Heli-Mount acoustic banjos and pioneer of electric banjo technology and continues to innovate with new tools for string musicians. You may see some Nechvilles in the hands of members of Elephant Revival, Dailey and Vincent, Emory Lester, Noam Pickelny, and other Wintergrass artists at the 2014 Wintergrass Festival in Bellevue. For certain, the Nechville booth will be in its customary spot, buzzing with activity. Stop by and say hello to Tom and Al.